The discovery of a Sabbath boundary marker in the Galilee several months ago makes one wonder just how many more have been preserved. Surely this was not the only one, either for this village or for other villages. Inscriptions in the rock like the Sabbath one were made at least twelve times around the city of Gezer. BibleWalks made the initial discovery and now they are encouraging others to join in the hunt. To assist in this endeavor, they have created several maps that show the Sabbath marker in relation to two ancient sites. Roads are then drawn out in each direction and the intrepid adventurer can explore these routes to discover the next inscription. As BibleWalks notes, when hiking the hills of Galilee, the joy is not only in reaching the destination but in the journey itself. You can get all of the details here. As we continue our new discoveries, we are excited to be able to bring you a summary of our results from 1985-2004 in the form of two final report volumes: Ashkelon 1 and Ashkelon 2. These two volumes provide over 900 pages of information on the ancient city of Ashkelon and can be downloaded free of charge due to the generous sponsorship of the Leon Levy Foundation. For those scholars who need the printed volumes, please note that they are still for sale at Eisenbrauns. These volumes – both in their publication, and now in their free distribution – reaffirm our commitment to making the result of our excavation available to the widest possible audience, so that all can appreciate appreciate and learn from the wonders of the history of Ashkelon. Eventually, each volume in the series will be available for download making the excavation of Ashkelon one of the most accessible in the world. I don’t have enough positive things to say. Ashkelon 1: Introduction and Overview (1985-2006) fills 700 pages and sells for $135. Ashkelon 2: Imported Pottery of the Roman and Late Roman Periods has 233 pages and sells for $45. Ashkelon 3: The Seventh Century B.C. has 28 chapters, 800 full-color pages, and sells for $93. The third volume was published this year and is not currently available for download. Under this model, libraries and institutions will purchase the book and help to cover publication costs. After several years the Leon Levy Foundation will provide the funding so that the digital file (pdf) is made available to researchers and students who otherwise might not be able to afford the purchase. There is much merit in this model and I would love to see other expeditions follow suit. Corrections and Updates to "Identifying Biblical Persons in Northwest Semitic Inscriptions of 1200-539 B.C.E." This article updates the cutoff point for the inscriptions treated in the book mentioned in the title, which was mid-2002, to July 31, 2008. It evaluates 32 proposed identifications (IDs) of biblical persons in ancient Near Eastern inscriptions of 1200-539 B.C.E. All 32 IDs or non-IDs are listed and indexed at the end. Shmuel Browns explains the significance of Khirbet Qeiyafa and concludes with a report of Israel Finkelstein’s paper on the Large Stone Structure and the Stepped Stone Structure in the City of David. He dates the SSS to both the Iron Age and the Hellenistic period. An ancient shipyard near Rome is being excavated. Antioch on the Orontes was a significant city in the early church. Today known as Hatay, the city’s museum boasts some impressive mosaics and other finds. But most is in storage until a new museum is built. The new museum is to have the capacity to host 800 people at a time and 10,700 square meters of exhibition space. Visitors who come to the Hatay museum can see around 906 square meters of mosaics at this point, though around 300 square meters are still in the museum's warehouse due to space shortages. In fact, the museum's total holdings include 35,433 pieces, but only 1,425 of these are on display due to serious space problems. With pieces from the Hittite, Hellenic, Byzantine and Roman eras on display, the Hatay Archeologicy Museum was always known as the second most significant mosaic museum in the world, following Tunisia's Bardo Museum. That is, until last week, when the Gaziantep Zeugma Mosaic Museum opened, and the Hatay Archeologicy Museum dropped to third place for mosaics. I’m surprised the Medeba Museum in Jordan is not ranked in the top three. A Ben-Gurion University research team has discovered a series of deep freshwater springs that spring from the floor of the Dead Sea and help replenish the body’s dwindling water supply, while a German group has meanwhile pinpointed new types of microorganisms growing in fissures on the saline seafloor near the springs, the university announced on Wednesday. Dead Sea groundwater springs have been known and visible for decades as they produce ripples on the water surface, but the current research has given scientists to the ability to study springs that are hidden from the eye, according to the statement. The springs, he continued, can be found at locations within the sea as deep as 30 meters down, and the largest spring observed thus far was 15 meters in diameter – with some spring systems totaling hundreds of meters in length. The full story is here. The Arutz-7 report is here. Excavations at the Central Bus Station of Beersheba are turning up remains from the Byzantine city. The southern steps leading to the Temple Mount may have been used by worshippers singing the 15 Psalms of Ascent, writes Wayne Stiles. Not so, argues Leen Ritmeyer, former architect of the excavations. “There are, however, more than 15 steps, in fact, there are 27 at the eastern end and 31 at the southern end.” I don’t think that is correct, and I do know that if you read Psalm 120 at the bottom of the staircase and advance by two steps (to the broader steps) for the next psalm, you’ll be reading Psalm 134 at the top of the staircase. Perhaps that’s just coincidence. Of course, the psalms could be sung in many places as the pilgrim came up to Jerusalem and the temple to worship. Shmuel Browns reports that the public can now walk from the Pool of Siloam to the Temple Mount via the (now underground) first-century street and drainage channel. If you’re tired of going to the Dead Sea and seeing scantily-clad men, there is now hope. A beach was dedicated on Monday for separate bathing. If they’d only open a third section for the men in Speedos, we would all be happy. A one-minute video at the Jerusalem Post shows the highlights of the Jerusalem Biblical Zoo. An automated ticket-selling machine is now in operation at the Giza Pyramids. Zahi Hawass’ successor has resigned. A Roman villa and a Byzantine mansion are being excavated in Antioch of Pisidia. Eisenbrauns has not only come up with some copies of the Student Map Manual, but they’re selling them for $3 each. It’s the “Deal of the Day” which I believe expires mid-day tomorrow (9/21). You want to do a serious study of historical geography that involves marking maps. You want to re-do your serious study (that wasn’t so serious because you were young, dumb, and in a hurry) when you went to study at the Institute of Holy Land Studies/Jerusalem University College or the Israel Bible Extension. You heard stories of this great work but never had a chance to purchase one. You want to teach a course using this classic work. You want each of your kids and grandkids to have a copy. There are newer works out that aim to replace this (a big cheer to the folks at Biblical Backgrounds here), but this work retains a value that I don’t think will ever be completely replaced. Note that in order to do the markings you will need a copy of James Monson, The Land Between. Amazon has a few used copies of this, starting at $4. 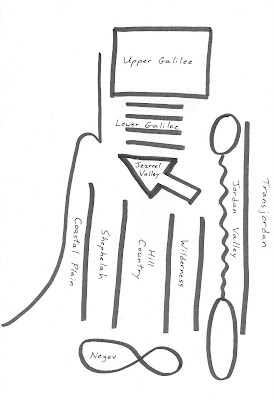 A map from one of the two Student Map Manuals I marked. This depicts the events in Joshua 10. Bible and Archaeology is a virtual museum of many of the most important artifacts, sites, and ancient texts related to the Bible. Three features make this online exhibit particularly helpful. The photos can be viewed in high-resolution. For one example, the image of the Merneptah Stele is the best I’ve seen. The artifacts are listed in chronological order. That makes it easier to find what you’re looking for, even if you don’t know the correct name (is it the Dan Stele or the Tel Dan Inscription?). Each photograph has a brief explanation of the significance of the artifact and its relationship to the Bible. You can do do additional research if you desire, but the description provides the basics. Note: it may be user error, but I had better success viewing the some of the high-res images in the Chrome browser than in Firefox. In the old days, if you wanted to know how to spell something, you looked it up in the dictionary. If you were looking for a technical term or a proper noun, you might require a specialized dictionary. Because the names of biblical sites are transliterated from other languages, and because time and tradition play a role, one often cannot say that there is “one right way” to spell a place name. In the case of biblical site names, there are several approaches to determining the best spelling. The first approach is to check with the authorities. I have often used the NIV translation as my standard. Recent scholarly Bible dictionaries are also good resources. A second approach is to determine what is most popular. I’ve used Google on many occasions to see which form is more widely used. Since what is “correct” in spelling is largely a matter of usage, this is less problematic than it might first appear. Another approach combines the best of the other two methods. By searching the scholarly literature, one can determine which is most widely used by the experts. Since my goal, in the projects I am working on, is to use names that are most common in the field, this has proven to be a worthy approach. By how does one search the work of experts? I use Logos 4 to search my entire library for a given spelling of a word. I confess that I owned the program for a year before I gave this a try, having been so traumatized by searches in Logos 3 that seemed to take weeks and months. But Logos 4 is almost as quick as Google. Because my library contains many of the best reference works in biblical history and geography, I have instant access to the way that the experts spell a word. So how does one spell Beth Shean, Beersheba, or Michmethath? Opinion is often divided, but knowing who and how many prefer a spelling usually helps me to make a good decision. Here is what I found by running searches on some more popular terms. Beth Shan or Bet Shean? The older sources tend to prefer the latter, while the newer works favor the former. En Gedi or Ein Gedi? The former gets 1,700 hits and the latter 500. The former is the place name; the latter is an autumn feast. The biblical name is the former; the modern city is the latter. My Logos library is consistent with the former but notes that Wikipedia uses the latter. The latter has the clear edge. I’m happy to have found a new, quick method to determine the best way to spell names of biblical sites in English. If you don’t already own a library in Logos or the Mac program Accordance, I wouldn’t claim that it’s worth investing in one just for this, but for those who already committed, this may be a useful tip. Google Books may be another alternative, although I have not checked to see if they include the resources I would consider most authoritative. Instructions for Logos users: Open program. Click the “Search” button. Make sure “All Text” and “Entire Library” are selected. Then type in search term. Wait 0.59 seconds. Two articles (at one link) describe this summer’s excavation of Gezer’s ancient water system, alleged to be the largest in all of Israel. The reports are lengthy and only a few excerpts will be given here. See the full articles for more details and photographs. Fans of the bumbling Robert Alexander Stewart Macalister will not be disappointed. Late in the last week of the 2011 dig, the NOBTS team found the natural cave at the end of the massive rock-hewn water system -- the prime objective of this season's dig. It is believed that the system's original water source is located in or near the opening of the cave. During next summer's dig, scheduled for May 27-June 15, the New Orleans team will focus on excavating the cave in hopes of answering several lingering questions about the water system. First and foremost, the team will try to discover how the Canaanites knew about the water source. Warner believes the Canaanites found the water source through an opening in the cave located outside the city walls. He speculates that the tunnel was cut to provide the city with a safe water source during times of siege....Another question involves the date of the tunnel's construction. After slowly digging through the rocks for a day and a half, the team reached the cave on June 7. It was 15 feet deeper into the water system than Macalister had recorded. The cave was filled to the top with fine, muddy silt. The last two days of the dig were spent cutting a 3-foot by 17-foot trench into the cave silt, readying the site for the 2012 dig. The final statistics from this summer are helpful in understanding the massive scope of the dig. According to Parker's calculations, the team removed 231 tons of debris (1,372 bags) in 17 days of digging. Warner and Parker's smaller 2010 team removed 68 tons of debris. The full reports are here. Both the Society for the Protection of Nature and liberal NGO Ir Amim have launched in the past two days parallel but unrelated campaigns against government plans to privatize 120 national parks. Led by MK Yisrael Hasson (Kadima), the government bill that would make the parks available for sale passed by majority vote in its preliminary Knesset reading on July 27. Among the parks slated for privatization, SPNI expressed specific concern about Palmachim Beach, the Judean Mountains National Park, Mekorot Hayarkon National Park, Hof Hasharon, the Carmel, Mount Tabor, the Alexander River and Masada. While the two campaigns against the bill have no direct affiliation to each other, they have nearly the same names – SPNI’s movement is called “Nature is not for sale” and Ir Amim’s operation is called “Not for sale” – and both argue that natural, public space must remain under national control. “The goal of the campaign is to convey the unequivocal message that it is forbidden to sell nature and to arouse the public to oppose the bill and sign a petition,” a spokesman from SPNI said in a statement. Masada National Park may be sold by the government of Israel. Last week I lamented that Joe Yudin’s tour of Jerusalem tombs would have benefited from some photos. Shmuel Browns has fulfilled that need with pictures and a map. In the heart of Mea Shearim in Jerusalem, the Ultra-Orthodox have held the first conference on “Torah archaeology.” This is a welcome change for a group known for its vocal, and sometimes violent, opposition to archaeology. The editors at Bible and Interpretation reflect on how they have scooped Biblical Archaeology Review multiple times this year. A couple of stories about the 12th Annual City of David Archaeology Conference were widely circulated this week. I held off posting, preferring a story that described what happened rather than predicted what might happen. What “newest research and discoveries” was revealed? Did the conference “overturn popular theories”? So far I have seen no reports. Seth Rodriquez has written and illustrated a simple way to teach people how to “draw the map” of Israel with its major geographic features. Robert Cornuke is well known in evangelical circles as a non-archaeologist with several astonishing archaeological discoveries. His latest video describes “possibly the Biblical find of this century!” He claims to have discovered the four anchors from Paul’s shipwrecked vessel off the coast of Malta. 1. Cornuke’s video misleads in claiming that only his location has the ocean depths as given in Act 27. 2. Cornuke’s video fails to inform viewers that there are other qualified bays that have a beach. 3. Cornuke’s greatest mistake is claiming that sailors would not have recognized the east coast of Malta. 4. Cornuke’s argument cannot account for the specifics of the shipwreck as described in Acts 27. For previous posts on Cornuke’s work on Malta, see here and here. Today the museum committee begins reviewing bids for the construction of the main exhibition halls. The new museum is scheduled to open in March 2015. The Grand Egyptian Museum (GEM) is located near the pyramids of Giza. Mohamed Abdel Maqsoud supervisor of the GEM pointed out that the first and second phases of the GEM project have been completed and included construction of the labs, storehouses, power station and fire fighting unite. He told Al-Ahram Online that until now 10,000 objects were transferred to the GEM from archaeological galleries all over Egypt and before the opening of the museum set for March 2015, the other 80,000 objects will be transferred. Among the objects on display are the unique funerary objects of Tutankhamun, Hetepheres, mother of the Pharaoh Khufu, Yuya and Thuya, the grandfathers of Pharaoh Akhenaten, Senedjem, the principal artist of Pharaoh Ramses II, the royal mummies and the treasures of Tanis. Mohamed Abdel Fatah secretary general of the Supreme Council of Antiquities (SCA) said that the museum will also house a conference centre with an auditorium for 1,000 to cater for theatrical performances, concerts, conferences and business meetings. The main auditorium will be supplemented with seminar rooms, meeting halls, a multi-purpose hall, along with an open plan gallery for accompanying exhibitions. A special section for children will be created in order to encourage young people to learn about their heritage. The full story includes two illustrations. There is so much going on that I need to make an early start on the Weekend Roundup. There will be more tomorrow. Ferrell Jenkins and Leon Mauldin are now traveling in Israel, with the goal of visiting places they have never seen before. Ferrell’s first post shows a well-preserved Roman road in the western hills of Judah and Leon’s features a Roman milestone. Shmuel Browns posts his list of “Top Ten” Jerusalem Sites. You might bring this list on your next visit to Jerusalem (or hire Shmuel to guide you around). Joe Yudin guides his readers on a tour of significant tombs in Jerusalem, including “King David’s tomb,” the so-called family tomb of King Herod, the Muslim cemetery in Mamilla, and Jason’s Tomb. I think an illustration or two would enhance the article. A group of archaeologists and students in Israel have submitted a petition to lawmakers to drop support for a law that would allow the continuation of excavations in the City of David that are funded by Elad. If you missed the “Office Hours” interview with Carol and Eric Meyers on Thursday, you may watch the video online. In the 50-minute interview, they discuss both professional and personal aspects of their lives in archaeology, including vandalism of sites, their children’s presence on digs, middle-of-the-night excavations, how to get a start in archaeology, and forthcoming books. Reuters has a brief story about tunnel systems carved by rebels during the first and second Jewish revolts. The Memory and Identity Working Group, University of California, Berkeley is hosting a lecture entitled “Mining for Solomon” by Professor Steven Weitzman (Stanford University) on Tuesday, September 6, 2011, 4:00 pm, 254 Barrows Hall. After a century-long search for traces of the historical King Solomon, archaeologists have recently claimed to locate the possible source of his fabled wealth in southern Jordan. Has scholarship at last found evidence of the real King Solomon? Weitzman's presentation will address this question by exploring the pre-history of the archaeological quest for Solomon, a quest with surprisingly important historical consequences that go beyond our understanding of the biblical past. For other upcoming lectures sponsored by the group, see their website. Trinity Evangelical Divinity School invites the public to a lecture by William G. Dever entitled “The Golden Age of Solomon: Fact or Fancy?” The lecture will be held on Monday, October 3, 2011 at 7:00 pm in Hinkson Hall, Rodine Building. A flyer may be viewed here (pdf).